#1 What's up with the toilet? #2 Ewww that is gross! Silence................more silence................the silence is killing me...... I finally yell out......"What exactly is going on with the toilet?" I wish there were words to describe the scene of a bathroom. But you wouldn't want me to, trust me.......I notice that #1 is lounging against the wall texting and #2 has gone back to the video game. Were they just going to live with it that way? I tell #1 to start plunging and he begins to gag, no not figuratively REAL gagging, eyes watering, pale face......you get it. So I am plunging my little heart out and I realize that #1 has gone back to lounging against the doorframe texting happily and #2 is taxing France for some tariff or something on his video game. So I snake that baby for all it's worth and fix the clog.......Hoooray Mommy! Now how does one get the snake from the upstairs to the garage without infecting the entire house? About a bajillion Clorox wipes is how. Now I'm feeling like I need the Silkwood Decontaminating Shower and to burn down half my house. I strip in the garage, throw away the gloves, run back up to my room, throw away my toothbrush, (I don't know, it just made me feel better) take a boiling hot shower, re-wash my hands, and go back to bed. I hear #1 go into the bathroom and close the door.......I yell, "You better not be....." I will let you guess the rest. So son #1 comes in and says, "are you going to blog about this?" and I say, "absolutely NOT, that was disgusting!!" and here we are..
That's hilarious! Sorry, truly I am. I've been there too. No snake, just a plunger. Helpless boys. They have learned the art of plunging now. In fact, when two of them went away to college. I bought them their own plungers! LOL... that was so funny... only because I have been there!! My son is 17. When he has friends over I seriously cringe when I hear the basement toilet flush because I am scarred by the same memory. Seriously... gross. Yuck. 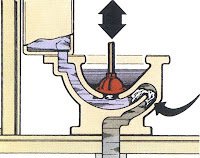 I'll never understand why any toilet is manufactured with out power flush. Yep.. been there too. But in my case it's my daughter with her own washroom. Suddenly I see she begins using MY washroom. A quick inspection shows me why! I had to stop buying 3 ply toilet paper. It's like flushing papertowel down there! She wouldn't put her hands on a plunger for all the money in the world. LOVE THIS! i swear this is the same conversation my nephews had last week (13 and 11 yrs old). their mom told it at the sunday dinner table and we were laughing so hard we cried! I'm the designated plumber in my home, too. Why are men afraid of fixing a toilet? oh how you make me laugh! I'm just superstitious enough to believe that just reading about it is going to curse my house! Dang it! I'm so scared of this happening! We have toilets that hang on the wall... the tank is inside the wall. Scared of that! Great information. Lucy me I found your sote by accident (stumbleupon).